displayed the results in real time. 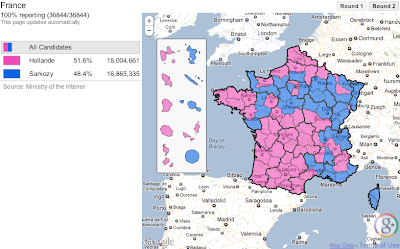 We used Google Fusion Tables to store the raw results data for France's 30,000+ communes/towns and 100+ departments. We updated our Fusion Tables in real-time alongside our map, feel free to dig into the tables to create your own visualizations and tools. You can also take a look at the official data from the French Ministry of the Interior here. Last Sunday, France went to the polls for the second round of its Presidential Elections. François Hollande, the socialist leader, won the race for the French presidency with just under 52% of the votes beating the incumbent Nicolas Sarkozy. As we did for the first round two weeks ago, our results map displayed the results in real time. 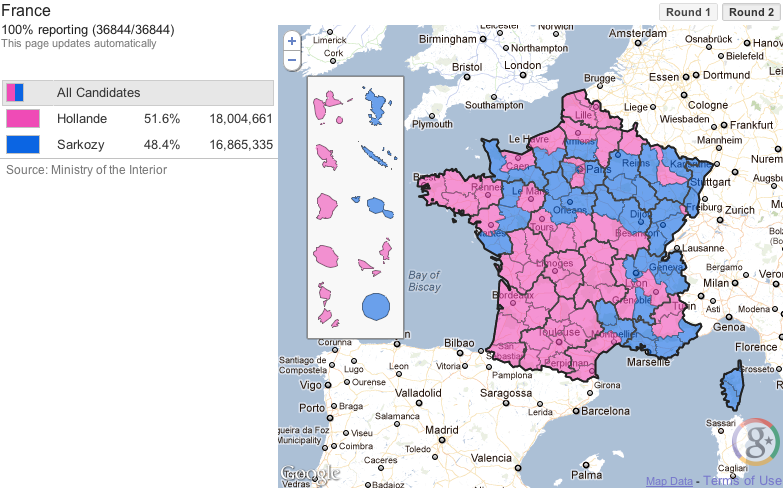 We used Google Fusion Tables to store the raw results data for France's 30,000+ communes/towns and 100+ departments. Do you want to write the best admission essay to apply to the best USA university or college? have a peek here for the best examples of the last year!